I’ve been away for a while – went on my honeymoon and have been playing catch-up since I got back. Add to that some family things that have needed my attention, and this thing here has been sorely neglected. So here’s a quick and easy recipe I tried a few weeks ago and have fallen in love with. I’ve been trying different recipes from the Sneaky Chef in the attempt to get the kids to eat more stuff – particularly my little stepson who needs more fiber but really doesn’t care for vegetables. The good thing is that he will try anything, which is seriously endearing. Plus, he’s almost sure to love anything if we call it a cookie. 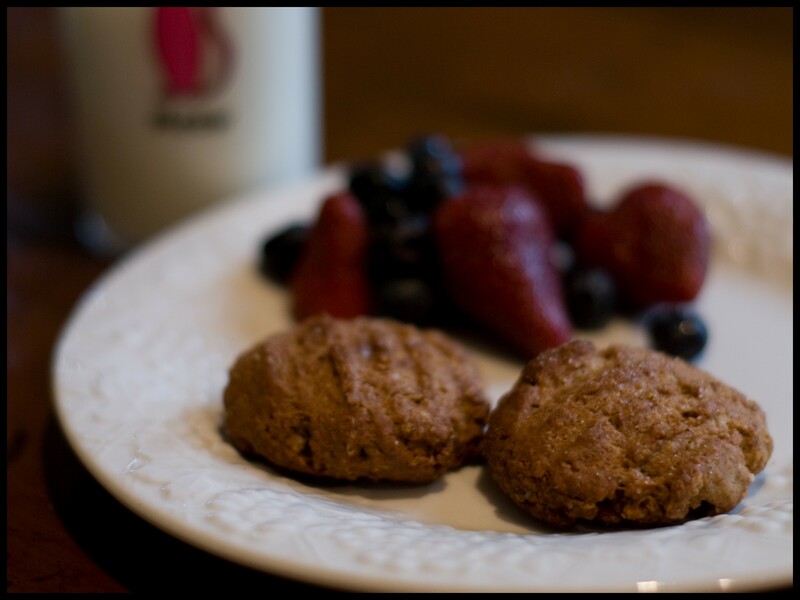 These little breakfast cookies, on the other hand – are keepers! I’ve actually become addicted to them. This past week has been especially hectic and I’m totally out of my routine – not knowing where I will be needed next, I’m all over the place. Having these little babies in the freezer, ready to grab on the way out the door has been a huge help. 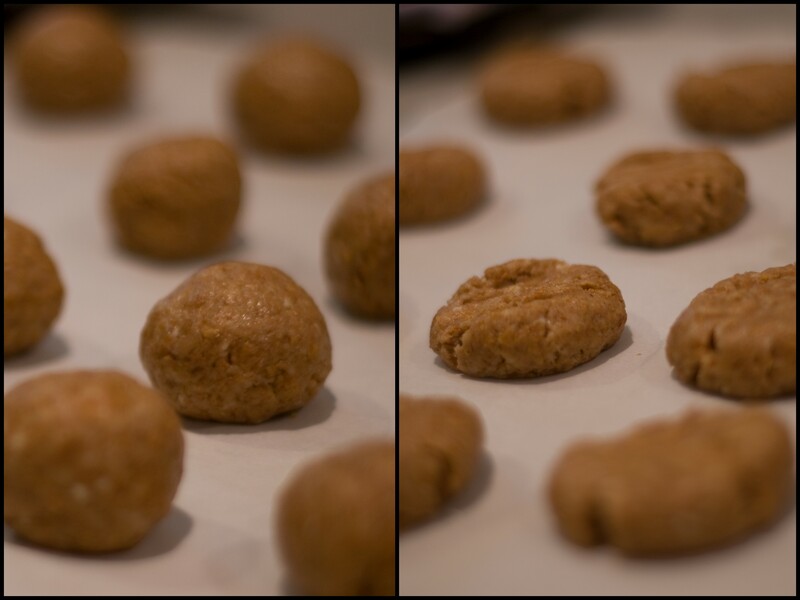 Made with cereal (I used Total) and ricotta cheese, among other things, they taste sort of like muffins but eat like cookies. They are just slightly sweet – just enough to satisfy, and they also have this yummy buttery richness to them which, combined with a hint of salt, satisfy the taste buds on several levels. Yum. I honestly love these. If you could use a healthy treat for your kids to eat when there’s no time for breakfast – give these a try. Really, they work as a treat any time, and you can feel good about your family eating them. 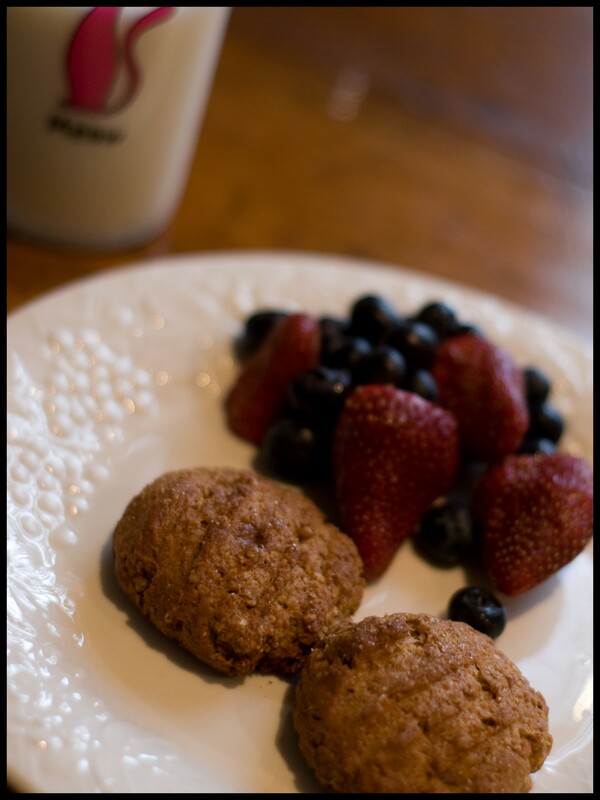 **Flour Blend is 1 cup each of all purpose flour, whole wheat flour and wheat germ. You can make this ahead and keep it on hand for other recipes. As my friend Karyn pointed out, you could just add 1/4 cup each of the three. Preheat oven to 400 and line a baking sheet with paper or spray oil. Gently crush the cereal in a bag – coarsely. I used a blender – a couple quick pulses. 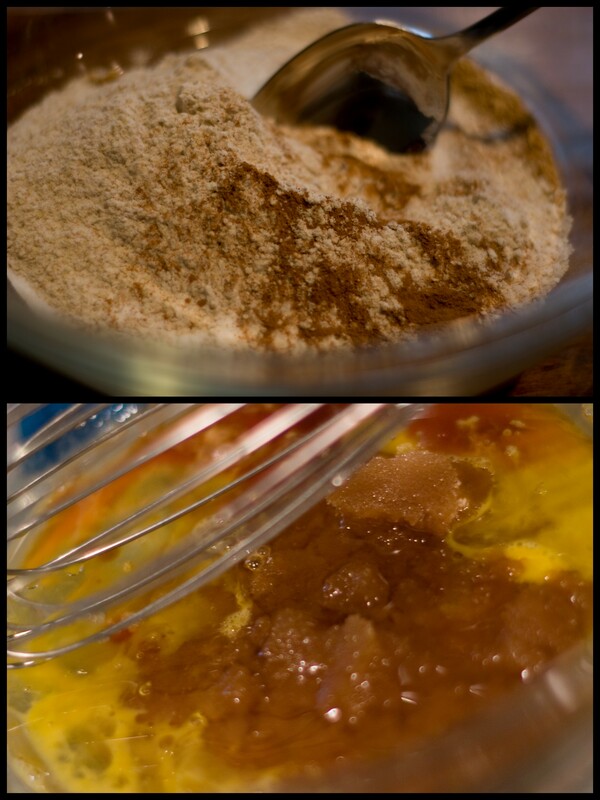 Whisk together flour blend, cereal, baking soda, salt & cinnamon in one bowl. 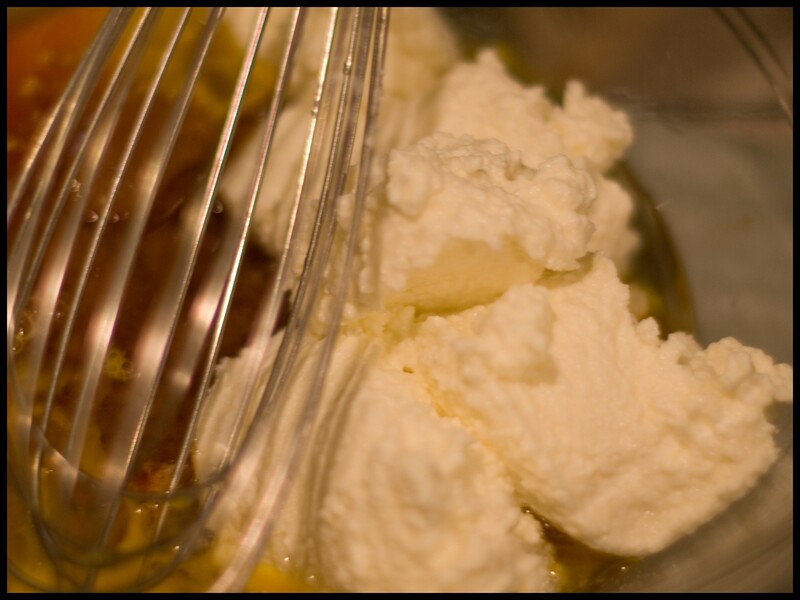 In another – whisk the egg, sugar, oil, vanilla & ricotta cheese. Drop them onto the baking sheet in single tablespoons and then flatten them with the back of a fork. 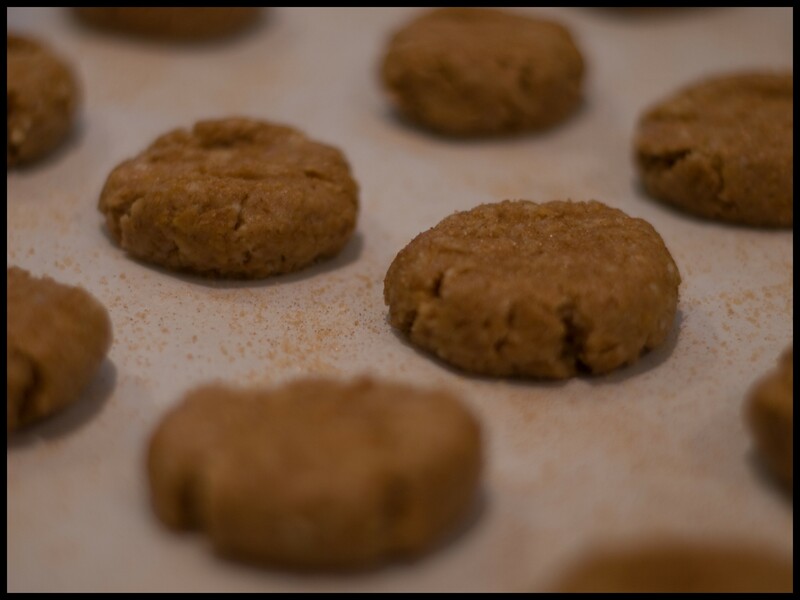 Sprinkle with the cinnamon sugar and bake for 18-20 minutes, or until the edges are browned and crispy. Approximate Nutritional Stats are using whole ricotta – not low-fat. Serving size is 1 cookie. I’d love some other recipes like this, so please post them in the comments section if you have any!